Few years back when Philip Kotler visited India, he was asked by a business reporter, if he has to add 5th P into 4Ps of Marketing (Product, Place, Price and Promotion) what that P would be. Kotler's reply was very apt, PEOPLE. People in different roles have become very important for all types of organizations and it has somehow given a direction to them to redesign their HR and Marketing policies, more so for their internal marketing. 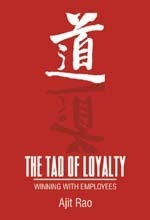 In these changing times a book got published in 2006, entitled 'The Tao of Loyalty - Winning with Employees' authored by Ajit Rao who through his research portrayed the importance of Loyalty in organizations and its different dimensions. Steven F Walker, an accomplished scholar and CEO of Walker Information, while putting his foreword to the book applauds the work done by Ajit and mentions that -Many corporations today do not ponder enough on the value that employees bring to their business. This book helps to bring focus on the very important role that employees have in maintaining and growing customer loyalty that will yield improved financial success. The book has 12 chapters (The 5th P of Marketing, Emotional Loyalty, Loyalty Segmentation, Eleven Factors that Matter, The Managerial Grid: Task and People, The Task Factors, The People Factors, Communication, The Three Levers, The Role of Leadership, The Role of HR, and The Role of the Boss) in all and is designed in such a way that as one turns the pages, one keeps discovering new concerns of loyalty and the ways to deal them. The book is based on the results of a questionnaire survey conducted on the basis of statements designed from the input by Walker Information Inc. and CSSM (Customer Satisfaction Management and Measurement) under IMRB International, who have been partners of Walker Information in India. The book starts with the first chapter on the 5th P, i.e., People. It discusses the important role of people in the organizations justifying that the degree of employees’ loyalty determines the degree of service quality. As he quotes Howard Shultz (Chairman and CEO of Starbucks and one of the authors of bestseller Pour Your Heart Into It) who use to think marketing as the most critical function and later realized that it was the people who were key to delivering great experiences in a sustained manner. Ajit explains the concept of Tao which is based on the Chinese philosophy where life is considered to be full of contradictions and successful individuals are those who are able to understand it and manage it better than others. He mentions in the first chapter (p 29) ‘The management of employees in any organization can apply this concept of contradictions to building a team of highly loyal employees. In this book the Tao question is to find out the way in which an organization manages its employees which results in having a productive group of people as well as this productivity is sustained for future. This is just one Tao and the book keeps unfolding different contradictions throughout along with the ways to deal with them, though the author keeps repeating at number of places that this is not a book on Hows but on Whys. The book identifies measures and suggests the dimensions of employees’ loyalty and its impact on their willingness to leave or stay with one organization. Two dimensions of Loyalty, viz., Emotional and Behavioral are discussed through examples and the author, through the data, successfully explains the impact of emotional loyalty on the behavior of employees. Ultimately it is the ‘feel-good’ employee who shows better loyalty to the organization as compared to a person who thinks that his/her potential is being exploited by the organization. It is more important an issue while we look at attrition rate of employees and their willingness to leave an organization for better salary package. The contribution of highly loyal employees is reflected through a very good example of Reliance when in 1989, their Patalganga complex was fully flooded and the consultants said that it would take atleast 100 days to clear up the mess, Reliance employees cleared the whole plant in just 3 weeks time. Such reflection of loyalty towards one’s organization is what makes an organization win its employees and sustain growth. Every organization is unique and has its own “threshold level” of loyalty. When an organization’s loyalty level drops below this threshold level, the behavioral scores of the organization drastically change. This statement mentioned at p 51 underlines the flexibility the organizations have as well as the result of loyalty on the behavior of the employees which finally in turn get reflected in the organizational performance. Intention to continue with the same organization also is measured to find out the loyalty levels. Ajit feels that emotional loyalty is more powerful way to look at employees than employee engagement. The employees are classified in four categories (chapter 3) as The Truly Loyals (46%), The Accessibles (5%), The Trappeds (19%) and The High Risk Employees (29%). This chapter explains the basic concept of emotional and behavioral loyalty through these four types of employees and how it can be measured and how an organization can identify ideal loyalty scores. The fourth chapter clearly outlines and suggests eleven key factors to be followed by the organizations in order to increase the size of Truly Loyal employees. These factors are Job Satisfaction, Role Outcomes, Resources, Sense of Accomplishment, Buy-into-Vision/Mission, Fairness, Care, Trust, Appreciation, Involvement, and Quality of Communication. These are validated through many studies taken up by Walker Information Inc in last two decades and are also been considered while conducting Great Places to Work surveys. Ajit suggests that the scores on these 11 factors can be averaged to provide one single score, which can be called the Tao Score (p 81). As students of management we have grown with the Managerial Grid as propounded by Blake and Mouton in 1957. Though this grid has been under scrutiny, yet its importance and relevance is not questionable at all. This grid has been under change after its formal publication and at present also stays as Leadership Grid. Ajit discusses this grid and relates it to the loyalty by bracketing the 10 factors into Task bucket (Job Satisfaction, Role Clarity, Buy-into-Vision/Mission/Values, Resources and Accomplishment) and People bucket (Fairness, Care and Concern, Trust, Being Valued and Appreciation) and keeping Communication as a common factor as foundation. Chapter 5 discusses these issues in details through related figures and diagrams which present the argument very convincingly. These factors are not to be taken independently rather they should be taken as complementary to each other as they depend on each other and have their influence on other as well. The Task factors are separately discussed in chapter 6 where the examples from Starbucks and the Built to Last corporations are put in such a way that the reader can get to the grip of these 5 task factors, their inter-relationship and inter-dependence and their role in building great organizations. As explained an employee’s engagement is gauged through the scores on these factors, a high score shall show high engagement thereby leading it to having better loyalty levels as well. Similarly chapter 7 discusses People factors in deep through various examples. It makes a good case for defending the interests of employees through the policies and action of the leaders and organizations as to being fair to its employees, showing care, concern and trust for them, acknowledging their contribution and providing enough space for their participation in the interest of the organization. The individuals having high scores on people factors are those who can create highly nurturing environment. While one looks at the Managerial Grid, one tends to follow such path which leads him/her to follow team management by balancing people and task related issues. Here too such balance is required though task factors seem more objective, tangible and visible as compared to people factors which look more subjective, intangible and invisible. Whatever if the organizations focus on these two type of factors with proper balancing, they would surely be successful in increasing the size of truly loyal employees which in turn shall be translated into their better contribution for organizational growth. Communication is put as a foundation for both types of factors, viz., Task and People, and it is discussed briefly in chapter 8. Undoubtedly it is one of the most important activities of the management for smooth coordination of its functions across different functional areas. At times it is the communication which is blamed for big disastrous decisions in the organization, so whether the organization concentrates on Task or People, it has to first make sure that it is able to properly communicate all its policies, programs and decisions. Chapter 9 briefly identifies three levers that are responsible for systematically concentrating on eleven factors that are outlined for leading a team of truly loyal employees. These three levers are: the leadership, the HR and the boss. This chapter of 3 small stanzas just provides the justification for choosing these three levers and the nature of the relationship that is required to be built for focusing on all the factors. In the next three chapters, their role is illustrated separately and clearly. These three chapters suggest Leadership Scorecard, HR Scorecard and Boss/Supervisor Scorecard. While the Leadership Scorecard is based on the issues related to mission, vision, values, customer focus, organizational priorities, faith, innovation, communication etc., the HR Scorecard deals with finding talented people, proper performance evaluation systems, job suitability and comparability, training opportunities for improving knowledge, skills and abilities, career growth, welfare benefits, policy alignment, effective reward systems, and fairness. The Boss/Supervisor Scorecard is developed on the basis of 5 Task factors, 5 People factors and Communication as a common factor. The scores are derived on the basis of team, unit/department, company average and best team score in the company which helps the decision makers to accordingly prioritize. The author puts a summary after all the chapters where he strongly writes that Employee loyalty must form an important part of marketing strategy as the final delivery is through people. …One important point we’d like to make is that there are perhaps some more factors (apart from 11 factors that are explained in the book) that may impact loyalty of which we are not aware. This is simply the start of a journey to explore how the loyalty levels can be measured and managed. …It is only when all the three roles (leadership, HR and boss) play their parts well, will the Truly Loyal levels be sustainable. There are four appendixes which are attached towards the end of the book explaining the methodology (Appendix A and D), a note on the reward penalty analysis (Appendix B), and the points to ponder for all the factors (Appendix C). A small bibliography at the end leaves the reader with a better reading list on the related issues. The book is written in a very simple language and the illustrations given in different chapters make the book lovable, convincing and clear. This is a small book with great work, mission and message (Loyalty) which not only is relevant for business organizations but for all types of organizations which are surrounded by people. Though the book was written around four years back, I strongly feel its relevance which guides the researcher to take up such ventures in future to further explore the spectrum of Employee Loyalty and may be to suggest measures to deal with the yin and yang (contradictions) within and beyond organizations. I strongly recommend this book to all management scholars and especially to those who deal in HR area.